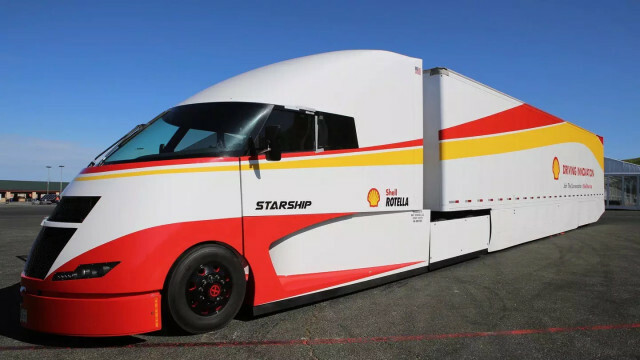 Truck driver Bob Sliwa hit the road on Thursday night in his carbon-fiber-bodied, diesel-powered semi truck, as he attempts to set a fuel economy record for big rigs by the time he pulls into Jacksonville, Fla., next Wednesday. 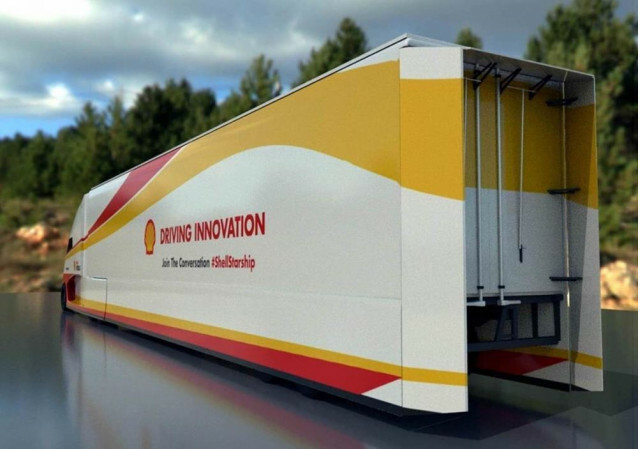 The endeavor, sponsored by Shell and the North American Council for Freight Efficiency, aims to boost more than miles per gallon. The big-rig test will attempt to learn more about maximizing freight-ton efficiency. The semi will be loaded with 50,000 pounds of cleaned reef materials. The truck measures 80 feet long, including the custom extended boat-tail affixed to the trailer. All told, it can be loaded to a maximum of 80,000 pounds, or 1,000 pounds a foot, loaded. Most semi trucks get about 7 mpg, unloaded, says Mike Roeth, executive director of NACFE. The Airflow Starship team expects to do much better than that. In addition to its carbon-fiber body and aluminum extenders, the truck benefits from active grille shutters like the ones found on many of today's cars. Full side skirts cover both the rear axles of the cab and trailer. It sports a full belly pan, and active aerodynamic flaps that cover the gap between the cab and trailer when the truck is on the highway. The flaps retract for maneuverability in the city. Heat from the 15-liter Cummins inline-6 is extracted through vents in the side skirts. Although the cab has mirrors, they aren't as bulky and sail-like as those on most semis. The Starship also uses dual rearview cameras and monitors to watch for cars. The engine is aided by a 48-volt battery pack, which drives an electrically powered tag axle (the rear-most axle on the cab; the middle axle transmits power from the engine). A 5,000-watt solar array on the roof of the 53-ft trailer charges the battery pack, which also runs the air conditioning and other cab loads. The electric tag axle also provides some regenerative braking to charge the batteries. There is no conventional battery. A 12-volt supercapacitor starts the engine, and an inverter runs standard accessories such as the full-LED light setup and the wipers. The axle ratios are stretched to 2.50:1 to keep engine speeds as low as 800 rpm on the highway, leaving the electric axle to apply torque to haul the rig up hills. The 18-speed automated manual transmission uses a custom-calibrated control module optimized for fuel efficiency. The Starship also uses a custom, automatic tire inflation system to maintain optimal tire pressures. The cab has forward-collision warning and electronic stability control. A custom digital instrument cluster will help Sliwa, who developed the truck, to keep tabs on all the systems. When the rig arrives in Jacksonville, NACFE will gather data logs from GPS tracking as well as the truck's onboard systems and will take it back to the lab to process. While they will be looking for a record in freight-ton fuel economy, the bogey to beat in straight fuel economy was set by Sliwa's last record semi, the 2012 Bullet truck, which returned 13.5 mpg hauling 65,000 pounds coast-to-coast.